Back in the summer of last year, I had the pleasure of photographing Laura Hopkins and Lee Cartwright's wedding. On this beautiful day the bridal preparations began at Golds hair salon in Gammon Walk Barnstaple. Here Laura and her 9, yes 9 bridesmaids! started getting ready for the day. When all the girls hair creations were complete, it was then back to Laura's Mum’s for makeup and the all important getting into the dresses. The ceremony took place at St Bannocks Church in Braunton, with some shots of guests arriving at the church, the ceremony and followed by some mingling shots of family and friends outside the church afterwards. 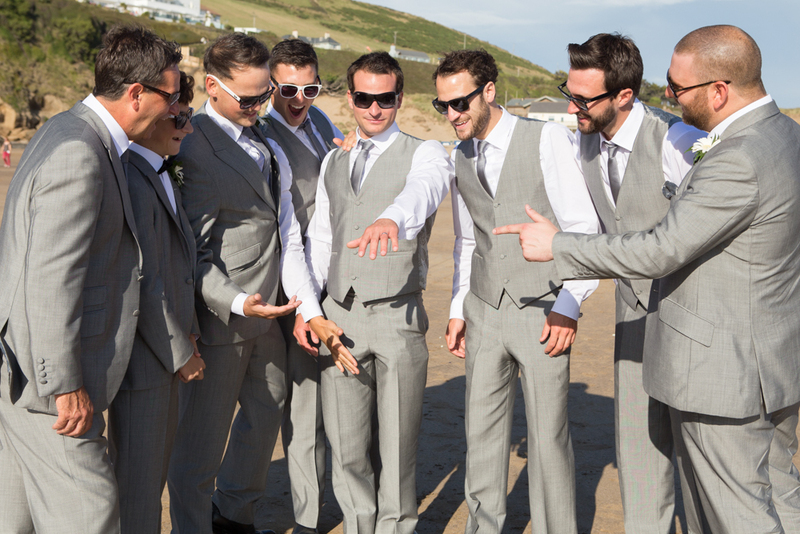 It was then time to head to The Sands Cafe at Saunton Beach, where the reception and wedding breakfast was being held. It was a gorgeously warm day and all the guests were outside enjoying pimms in the sunshine on the balcony. Before the meal it was time for the speeches. This is always a great pleasure to photograph and capture the many emotions that surface from happiness, sadness and even pure embarrassment. After the meal Laura and Lee were eager to go onto the beach with everyone for some fun shots. Laura and her 9 bridesmaids kicked of their flip flops, hitched up their dresses to paddle in the sea. I even rolled up my suit trousers up took off my socks and shoes and ended up going further out into the sea, so I could get the perfect shots of them. I then realised that this fun loving lot would be partying hard throughout the evening and they did. During the evening Laura and Lee cut their amazing cake which was created by Choccy Woccy Doodah. Then it was time for the first dance and immediately afterwards the dance floor filled up and was packed all night long. If you are getting married and are looking for a photographer, please feel free to get in touch. Or come and say “Hello” and have a chat on Sunday, as I’ll be at the Saunton Sands Wedding Fair, Sunday 10th January between 11am and 3pm.